My favorite Knizia game. Indeed, one of my favorite games. What separates hobby board games from the majority of mass-market titles, aside (arguably) from fun, is the name on the box top. Like the byline on books or the signature in the corner of a painting, hobby board games typically bear the name of their creator. But more than their name, hobby board games typically bear the style of their creator as well. Just like you might expect different things from a book by Kurt Vonnegut than you would from Graham Greene, you can expect different things of a game depending on whose name is on the box top. The Name on the Box Top may become a regular series about game designers, their trademarks, and what I think of their designs. Or it could die here. In any case, I want to talk today about one of my favorite designers: Reiner Knizia. I know, I know: it’s not fashionable to like the good doctor, just like it’s not fashionable to like Settlers of Catan, anymore. “Games have come a long way!” we say. But Reiner Knizia really does have some fantastic elements to his games and is deserving of his accolades. The first thing I would call one of his trademarks is creative scoring. The easiest way to get players to change their behavior is to change their target, and Knizia is a master at this. Even a simple auction filler like Money! is made interesting through Knizia’s scoring twist—essentially, having all the cards of one suit is better than picking and choosing from other suits (unless you’re very selective in your other endeavors). Players score points by suits and only keep all their points if the suit is valued at 200 or more. This can be confusing, but it forces players to reconsider how they should go about collecting cards. Should they gamble on a new suit or build up a suit they’re already comfortable in? Each suit has a maximum point value, so players must be savvy in their trades. Money! is in many ways about collecting in big suits, using other suits to bid for what you want and withholding scoring opportunities from the other players. Tigris and Euphrates, on the other hand, is a game about balance. There are four spheres to score points in, and at the end of the game, a player’s final score is the number of points scored in that player’s weakest sphere. In other words, if a player has a monopoly on red and completely forgets black, that player will lose to the player who has only moderately built up all four spheres. Knizia alters the goal and so alters the way the game is played. An interesting middle ground between these two scoring systems is Ra (a game that I think is brilliant but @Futurewolfie—wrongly—hates). Ra is a pure auction game, and an auction is only as valuable as what a player is collecting. Thus, a player who is trying to collect Niles might find a track full of Pharaohs worthless. A disaster tile targeting monuments means nothing to a player who has no monuments but everything to a player whose strategy depends on them. Add in that what you use to bid with is always exchanged with what was used to win the last bid, and there are decisions galore in this game. It scores differently for each player depending on what that player collects. Knizia’s scoring systems can be tough to teach, but usually if you can sell the concept, new players catch on quick. Of course, the second trademark of Knizia games is thin theme. I love Ra, but is there anything distinctly Egyptian about it? I love Money!, but does it feel like I’m trading currency? Through the Desert is a fantastic abstract game, but that’s just it: it’s an abstract game masquerading as something more. This doesn’t bother me most of the time. 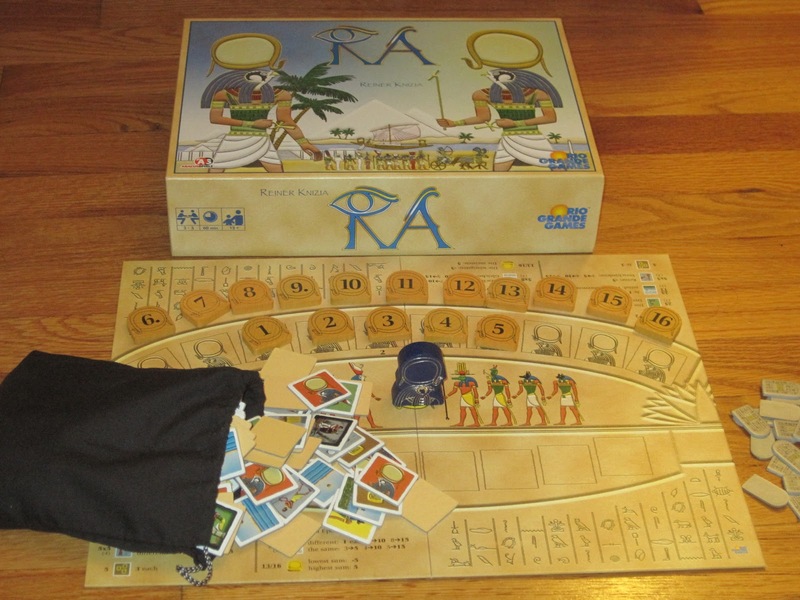 Who cares if I’m in space, or ancient Egypt, or at the dawn of civilization: what I’m looking for is an excellent play experience, and here Knizia delivers. I know this is by no means comprehensive, and I know there are varying opinions on Doctor Knizia. So let’s have ’em in the comments. What do you like? What do you not like? Is Knizia the “good doctor,” or are you eating an apple a day? Previous ArticleFDQ: Do You Add Bling to Your Games? Wolfie, as we discovered on Twitter this morning, there are those of us who like spreadsheets and, yes, even math. 1. I have never embargoed RA. I even asked for it a couple extra times to see if I could “get” it. Even though that failed, I would still be willing to play. 2. I don’t know how all-day FFG games taxes you… you’ve never played one. Grumpy Jon is Grumpy. 1. Dramatic license for effect. 2. On the contrary, I have. I would call six hours of Android an all-day FFG affair. And yes, it was six hours. And yes, it was FFG. I like this idea for a segment, please keep it coming! I would love to hear your take on one of my favorite game Designers, Vlaada Chvatil. Galaxy trucker is one of my favorite games, and I generally love all the bright artwork and neat mechanics that make his games so distinct.